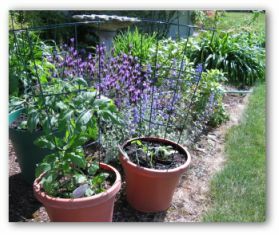 Easy vegetable garden layouts for several types of simple home garden designs are shown below. 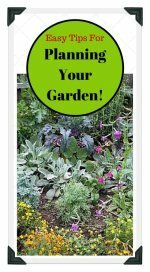 Learn how to plan a garden that works for the amount of time and space you have available for gardening! Design Your Own Vegetable Garden Using our Free "Vegetable Garden Planner" Software! There are many types of garden plans that can work for a home garden. 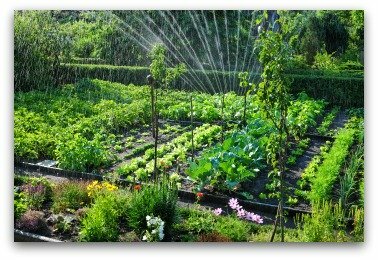 Finding basic garden plans to design your garden is an important first step in planning a vegetable garden. 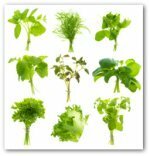 If you have a sunny location in your backyard for an in-ground garden, there are several types of vegetable garden plans will work for you. 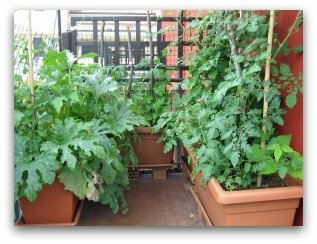 If you don't have room for a traditional backyard in-ground garden, there are many other options available such as a container, square foot, or raised bed vegetable garden. Whatever type you choose, growing your own produce can be a healthy adventure and a great learning experience! 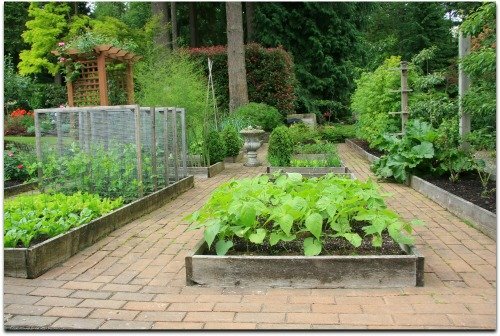 The traditional backyard vegetable garden design is usually straight and long rows running from north to south. Anything growing tall, like corn, beans or peas are planted on the north side of the vegetable garden to keep them from casting shade on the shorter crops. Medium growing vegetables like tomatoes, cabbage, broccoli, squash and pumpkins are planted in the center, while the southern end of the garden contains the shorter plants, like carrots, beets, lettuce, radishes and onions. In general, a vegetable garden design runs from south to north, to make the most of sun exposure and air circulation. This very basic vegetable garden design is meant to make cultivation easier, as well as for convenience when weeding and harvesting. With smaller yards and urban gardens becoming common, the traditional basic vegetable garden layouts design doesn't always work well. There are several other options to consider. This is a great garden plan when you have a small amount of space in your yard, or on a sunny porch or patio, in which to locate your garden. Build a four foot by four foot wood frame as the border for your garden. Add potting or garden soil and fill to one or two inches below the top of the border. 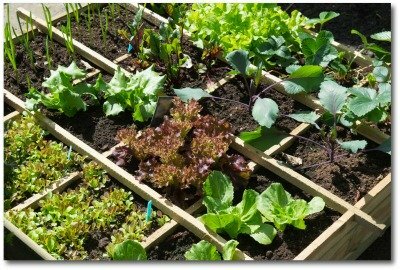 Divide the garden into 16 squares, and mark the squares with small one inch strips of wood, or string. Plant each of the 16 squares with a different vegetable plant, following the spacing instructions on the back of each individual seed packet. One of these four foot gardens will grow enough fresh produce for one person. This size garden is very easy to build, plant, tend and harvest. 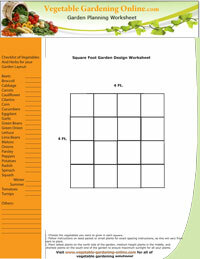 Download our free garden planning worksheets to plan your square foot or other types of vegetable garden. When you want a garden that is both beautiful to look at, and easy to care for, a raised-bed garden can be the way to go. It is best if the garden is not more than four feet wide, so that you can reach the center from either side. It can be any length that you want or have room for. If you use attractive material to build the border of the garden, it can become a feature or focal point in your landscape plan. Add a few marigolds or nasturtiums for color and insect control, and you have a beautiful and functional vegetable garden! If simplicity and convenience appeal to you, then a container garden may be perfect for you. Arrange some pots or containers in a sunny location in your yard, or on your porch, deck, patio or balcony. You can recycle containers you already have on hand, or purchase colorful inexpensive plastic pots, or buy expensive beautiful ceramic planters. The more pots, the better. Fill each container with high-quality potting soil, and plant with vegetable seeds or transplants following the spacing instructions on the packet or plant. You can also add some hanging containers if the location permits. Container gardens are vulnerable drying out quickly in hot weather, so keep a close eye on them during hot spells! Your garden will grow best in enriched well-conditioned soil. If you don't know your soil composition, it is best to find out by taking a sample to your local garden center. Then you can add compost, sand, humus, fertilizer and any other ingredients as needed to create the best environment for your plants. 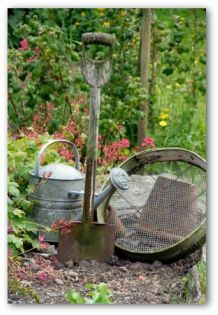 In order for your garden to thrive, the soil should also be well-drained. 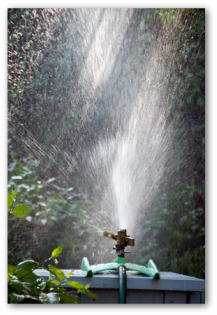 Be sure to locate your garden near a convenient source of water. Especially when the plants are small, they will need to be watered frequently as the root systems are small and will dry out quickly. After your plants are well-established, less frequent but deep watering is best. Plant your garden away from tree and shrub roots that can take moisture away from your plants. It’s important to know that there are many variations of vegetable garden layouts and designs. These are a few of the most basic and easiest garden plans. Whether you are a beginner or an experienced gardener, finding the right design for your vegetable garden is part of the adventure. So experiment, and have some fun!